Your privacy is important to Lazy Bear Cabin. This privacy statement provides information about the personal information that Lazy Bear Cabin collects, and the ways in whichLazy Bear Cabin uses that personal information. any other information that you send to Lazy Bear Cabin. Where Lazy Bear Cabin discloses your personal information to its agents or sub-contractors for these purposes, the agent or sub-contractor in question will be obligated to use that personal information in accordance with the terms of this privacy statement. 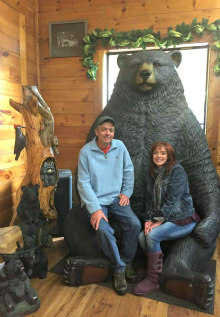 In addition to the disclosures reasonably necessary for the purposes identified elsewhere above, Lazy Bear Cabin may disclose your personal information to the extent that it is required to do so by law, in connection with any legal proceedings or prospective legal proceedings, and in order to establish, exercise or defend its legal rights. Lazy Bear Cabin will take reasonable technical and organisational precautions to prevent the loss, misuse or alteration of your personal information. Lazy Bear Cabin will store all the personal information you provide [on its secure servers]. Lazy Bear Cabin is not responsible for the privacy policies or practices of any third party. by post to 426 Carver Ave Roanoke, VA 24012. Lazy Bear Cabin has a zero-tolerance spam policy. Lazy Bear Cabin’s messaging systems automatically scan all incoming email [and other] messages, and filter-out messages that appear to be spam. No message filtering system is 100% accurate, and from time to time legitimate messages will be filtered-out by Lazy Bear Cabin systems. Lazy Bear Cabin provides a facility that enables users to send [email messages / private messages] to others. Users must not use this facility to send unsolicited, bulk or indiscriminate messages, whether or not for a commercial purpose. In the unlikely event that you receive any message from Lazy Bear Cabin or sent using Lazy Bear Cabin systems that may be considered to be spam, please contact Lazy Bear Cabin using the details below and the matter will be investigated. Lazy Bear Cabin may amend this anti-spam policy at any time by publishing a new version on this website.